Last Day of the We Care East LA Toy Drive is TODAY! We are well into the holiday season and one of our very favorite events is almost upon us--in fact it is TOMORROW! We Care East LA's goal is to provide all of these wonderful things for every single family which attends the event and more people attend every year. So the need is greater this year than ever! Won't you help us make sure every single child goes home with a toy this year? Make that loot pile even taller? You still have time to drop off a toy at any of our offices to help make a Merry Christmas for a needy child in our community!! 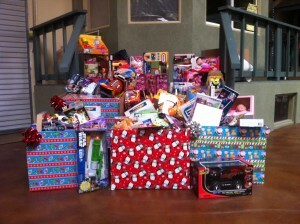 We are collecting new, unwrapped toys in all of our offices from now until the end of the day TODAY! AirTek and Alliance are committed to making a difference in our community. Please join us in that commitment and bring a toy!